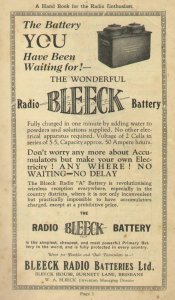 Marked W.A.Bleeck (Inventor) Managing Director, Bleeck House, Burnett In, Brisbane. 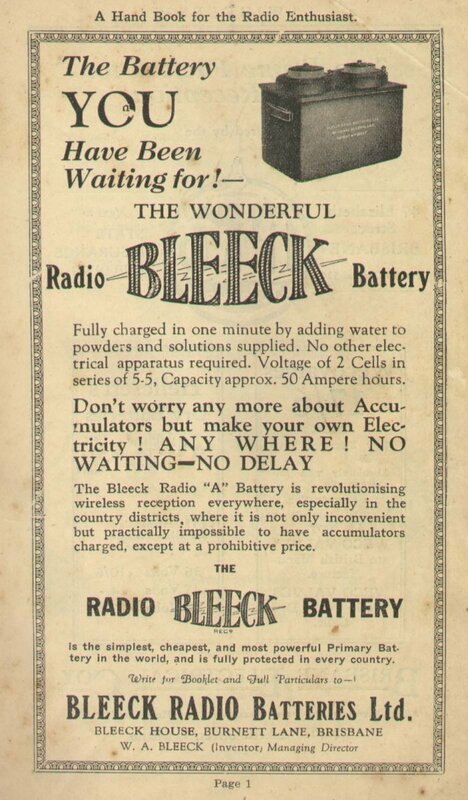 Black rubber "deluxe model"; two cells; graphite/Zn electrodes, separated by porous earthenware pot. Designed to give reliable power source for radios and various other electrical items, esp. when rural areas did not have power supply. Fully charged, gave 50 ampere hours of current supply. Recharged by adding solutions and powders to water in cells. Zn cathode slowly dissolved, solution ions moved through pot. Was heralded as a breakthrough in battery technology, supplying relatively high voltage per cell with low internal resistance, large power storage, easily recharged in a short time, no toxic fumes given off.